Put on your walking shoes and embark on a tour that gives you fascinating insights of the buildings and monuments around the Fort area in South Mumbai. This tour is sure to keep you mesmerized with interesting information about the history, backdrop and trivia that every monument and building has in store. Our guides for this tour are experts in the field as they provide you with complete and up-to-date information of the sights, buildings and monuments on the way. 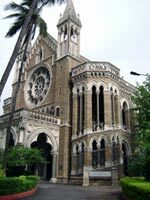 The tour starts from Gateway of India and then the memory lane goes down Mumbai Police Headquarters, Regal Theatre, Rajabai Tower, Mumbai University, High Court, Horniman Circle, Ballard Pier, Asiatic Library, David Sassoon Library, Fountain and CST station. 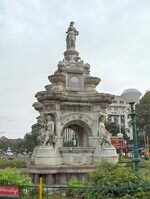 The total duration of the tour is approximately 2 hours from the starting point which is normally Gateway of India. It is advisable to wear comfortable walking shoes and wear light, cotton clothes.